One of the largest carnivorous reptiles during the late Triassic, Postosuchus grew to 13 feet long. Icarosaurus, an extinct gliding reptile that lived 200 million years ago. Life recreation of Stegomus arcuatus, an armored reptile from Connecticut. Supported by the Deborah G. and Charles M. Royce Exhibition Fund, Connecticut Office of the Arts, and a Committee of Honor. Last Days of Pangea highlights local discoveries that place the Connecticut Valley at the epicenter of one of the most dramatic eras of prehistory. Two hundred million years ago, early dinosaurs lived alongside bizarre reptiles on the supercontinent Pangea. 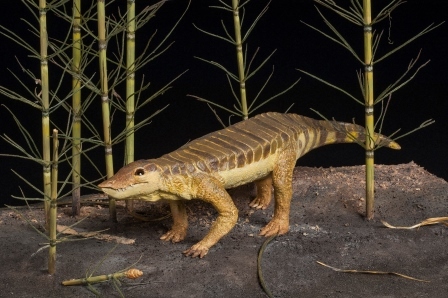 These denizens of “Triassic Park” included armored crocodile relatives, long-necked reptiles that swam like frogs, and a unique lizard-like animal that glided on a membrane supported by outstretched ribs. They wandered the region, leaving footprints along the muddy lake shores and skeletons in the sandy floodplains. Unbeknownst to these creatures, the age of Pangea would soon come to a violent end. As the Triassic Period gave way to the Jurassic Period, the Earth itself split open along a seam that ran through the center of Connecticut, unleashing a massive flood of lava that triggered extinctions throughout the globe. In the aftermath, dinosaurs rose from humble beginnings to launch a 135-million-year reign. This exhibition explores the geological record of the sundering of Pangea and showcases fossils ranging from tiny oddballs to ferocious predators. historic footprints collected from throughout the Connecticut Valley in the 1800s including those of our Connecticut state fossil: the dinosaur track Eubrontes. 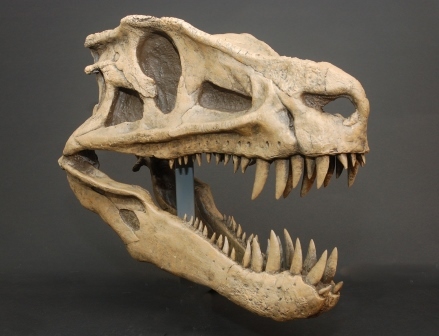 Last Days of Pangea: In the Footsteps of Dinosaurs is organized by the Bruce Museum and curated by paleontologist and Bruce Museum Curator Dr. Daniel Ksepka with assistance from Paul Griswold Howes Fellow Kate Dzikiewicz. 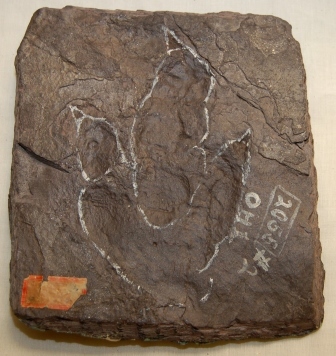 The large dinosaur footprint Eubrontes was the first known dinosaur track discovered in North America and is the state fossil of Connecticut. Bruce Museum Collection.